As you know, our HostPilot control panel, makes managing user accounts, services and devices for all Intermedia cloud services a breeze. From any web browser or mobile device, you can easily manage your IT services while getting the same level of security and control as you would with on-premises deployments. So you’ll be excited to learn that we have made some updates to the design of HostPilot to increase your productivity and simplify user and service management. Contextual Inquiries: We observed the way our customers use HostPilot to see which tasks they were doing frequently versus first-time tasks. 2. 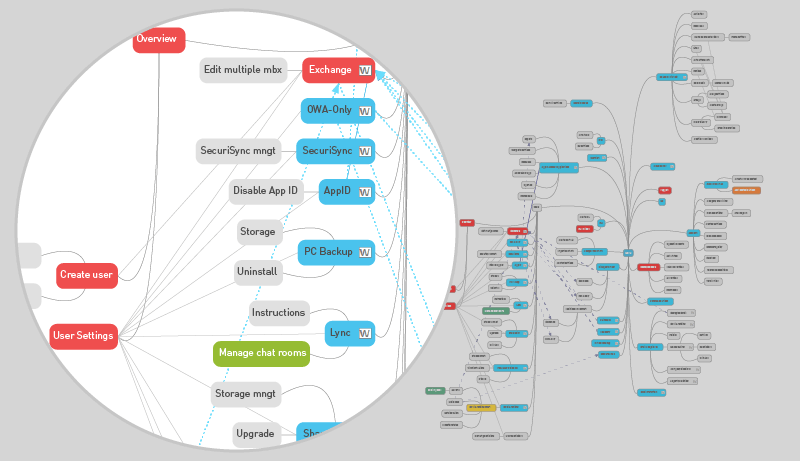 UX Design Architecture: We mapped out how HostPilot was structured to see how we could improve the navigation. 3. 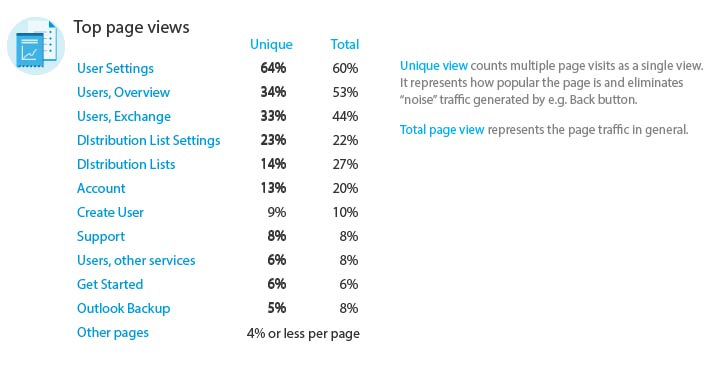 Analytics: We used analytics to learn which pages are most frequently accessed in HostPilot to help determine the focal points for our improvements. Based on the findings from our research, we came up with two key user goals for the HostPilot re-design, as well as our biggest hurdle to overcome for each one. Frequently-used items should be quickly accessible. All controls for a product should be accessible in one section. Issue to resolve: A product’s settings are located in multiple locations which confused users. 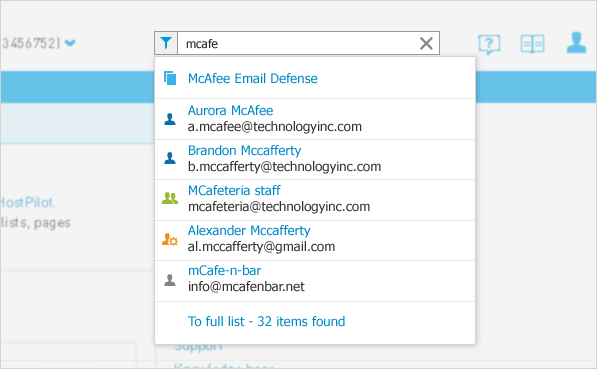 Search Feature: To achieve the goal of quick access, we’re introducing a search feature in HostPilot. You can also apply filters to narrow down the search results. Previously when looking for a specific menu item, you had to search through a large list for the correct item. We have improved navigation efficiency by moving users to a separate top menu item for quick access and easy organization. We restructured the menu and changed the design to make it easier to find what you’re looking for. When managing a particular product, customers often want to have the features on hand. 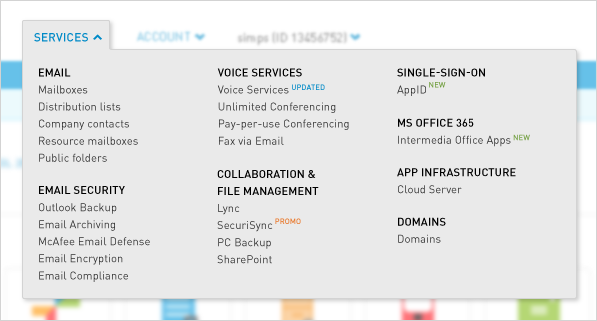 To address this need, we created multi-component service pages for Email Archiving, Voice services, and AppID. We have added similar functionality the Hosted Exchange area as well. 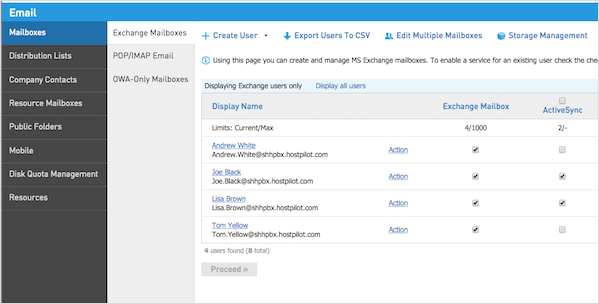 As many as 27% of customers go to HostPilot for distribution list management, and 60% for user management. We’ve simplified navigation from mailboxes to commonly used distribution lists, company contacts, and resources which are available in the left-hand navigation. We have also granted quick access to all account group items, so the landing page account is no longer a roadblock. 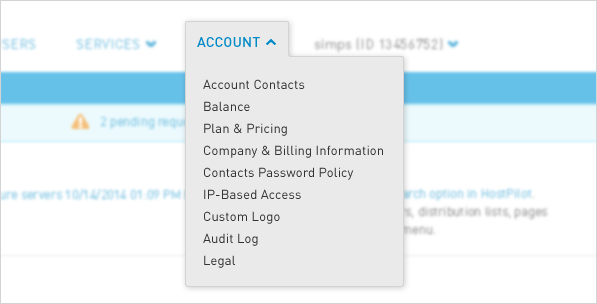 Account administrators no longer need to go to Account > Account Contacts to manage their profile or reset passwords – it’s now available directly in the profile drop down menu. 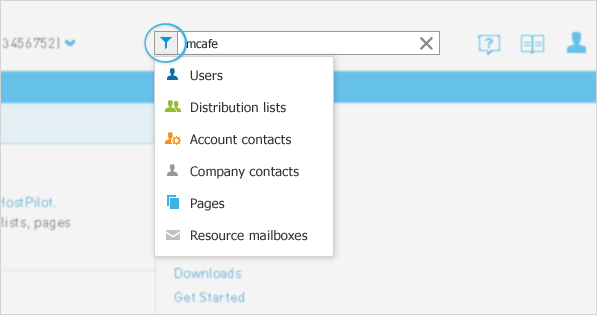 We encourage you to log in to HostPilot and explore these new features. Love it, hate it or want to share feedback on the changes we’ve implemented or future changes you’d like to see implemented? Share your thoughts with us at feedback@intermedia.net. All comments are welcome.